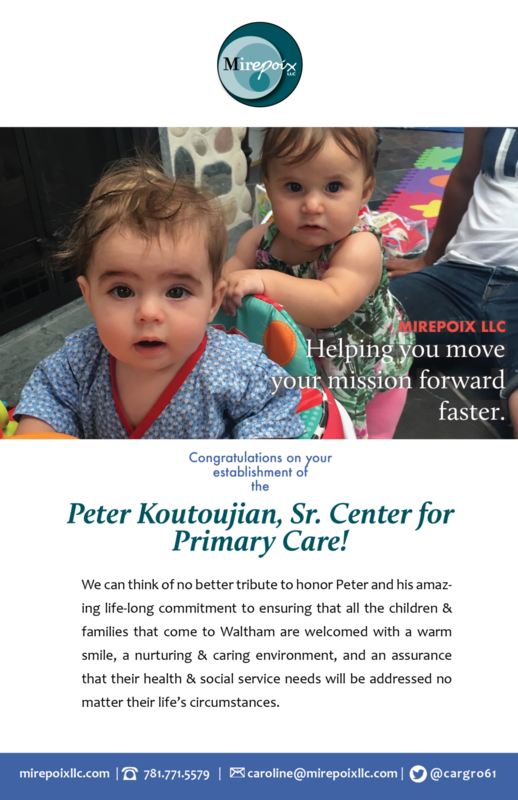 We at Mirepoix are proud to support the Peter Koutoujian Sr. Center for Primary Care with this full-page ad in the program book and we encourage others to join us in supporting the great work of Charles River Health! In 2016, Charles River served more than 5,200 people at our Waltham location during more than 27,000 visits. Our waiting list for new patients averages from 80 to 100 patients per month. Fifty-nine percent of our patients require their services to be delivered in a language other than English and Our patient mix includes a higher percentage of people (42%) without health insurance than any other community health center in Massachusetts. Want to learn more Quick Facts about Charles River Community Health: state of the art delivered with heart? We need your support so we can move into our new Waltham site as planned this coming fall. The FIRST FLOOR will house our Peter Koutoujian, Sr. Center for Primary Care, including medical, dental, and behavioral health clinics, as well as a pharmacy. An expanded number of exam rooms and ample space for health education provided by nursing, nutrition, and family-planning staff ensure we provide comprehensive, integrated services aligning with the Patient Center Medical Home model of care. The first floor also features large windows on three sides of the space, bringing wonderful light into the patient waiting room, as well as clinical spaces, to promote a calming and healing environment. The LOWER LEVEL will house non-clinical services to address social determinants of health, including health insurance enrollment, and our community health department – which distributes donated car seats, bike helmets, clothing, toiletries, and other items to patients in need, and connects patients with community services like food, legal, and housing assistance.